Hemodynamics or hæmodynamics is the dynamics of blood flow. The circulatory system is controlled by homeostatic mechanisms, such as hydraulic circuits are controlled by control systems. Hemodynamic response continuously monitors and adjusts to conditions in the body and its environment. Thus hemodynamics explains the physical laws that govern the flow of blood in the blood vessels. Blood flow ensures the transportation of nutrients, hormones, metabolic wastes, O2 and CO2 throughout the body to maintain cell-level metabolism, the regulation of the pH, osmotic pressure and temperature of the whole body, and the protection from microbial and mechanical harms. Blood is a non-Newtonian fluid, best studied using rheology rather than hydrodynamics. Blood vessels are not rigid tubes, so classic hydrodynamics and fluids mechanics based on the use of classical viscometers are not capable of explaining hemodynamics. The study of the blood flow is called hemodynamics. The study of the properties of the blood flow is called hemorheology. Blood is a complex liquid. Blood is composed of plasma and formed elements. The plasma contains 91.5% water, 7% proteins and 1.5% other solutes. The formed elements are platelets, white blood cells and red blood cells, the presence of these formed elements and their interaction with plasma molecules are the main reasons why blood differs so much from ideal Newtonian fluids. Normal blood plasma behaves like a Newtonian fluid at physiological rates of shear. Typical values for the viscosity of normal human plasma at 37 °C is 1.4 mN·s/m2. The viscosity of normal plasma varies with temperature in the same way as does that of its solvent water; a 5 °C increase of temperature in the physiological range reduces plasma viscosity by about 10%. The osmotic pressure of solution is determined by the number of particles present and by the temperature. For example, a 1 molar solution of a substance contains 7023602200000000000♠6.022×1023 molecules per liter of that substance and at 0 °C it has an osmotic pressure of 2.27 MPa (22.4 atm). The osmotic pressure of the plasma affects the mechanics of the circulation in several ways. An alteration of the osmotic pressure difference across the membrane of a blood cell causes a shift of water and a change of cell volume. The changes in shape and flexibility affect the mechanical properties of whole blood. A change in plasma osmotic pressure alters the hematocrit, that is, the volume concentration of red cells in the whole blood by redistributing water between the intravascular and extravascular spaces. This in turn affects the mechanics of the whole blood. Where a is the particle radius, ρp, ρf are the respectively particle and fluid density μ is the fluid viscosity, g is the gravitational acceleration. From the above equation we can see that the sedimentation velocity of the particle depends on the square of the radius. If the particle is released from rest in the fluid, its sedimentation velocity Us increases until it attains the steady value called the terminal velocity (U), as shown above. Hemodilution is the dilution of the concentration of red blood cells and plasma constituents by partially substituting the blood with colloids or crystalloids. It is a strategy to avoid exposure of patients to the potential hazards of homologous blood transfusions. Hemodilution can be normovolemic, which implies the dilution of normal blood constituents by the use of expanders. During acute normovolemic hemodilution, (ANH) blood subsequently lost during surgery contains proportionally fewer red blood cells per millimetre, thus minimizing intraoperative loss of the whole blood. Therefore, blood lost by the patient during surgery is not actually lost by the patient, for this volume is purified and redirected into the patient. On the other hand, hypervolemic hemodilution (HVH) uses acute preoperative volume expansion without any blood removal. In choosing a fluid, however, it must be assured that when mixed, the remaining blood behaves in the microcirculation as in the original blood fluid, retaining all its properties of viscosity. If ANH is used as long as SBL does not exceed BLH there will not be any need for blood transfusion. We can conclude from the foregoing that H should therefore not exceed s. The difference between the BLH and the BLs therefore is the incremental surgical blood loss (BLi) possible when using ANH. Where RCMi is the red cell mass that would have to be administered using homologous blood to maintain the Hm if ANH is not used and blood loss equals BLH. The model used assumes ANH used for a 70 kg patient with an estimated blood volume of 70 ml/kg (4900 ml). A range of Hi and Hm was evaluated to understand conditions where hemodilution is necessary to benefit the patient. The result of the model calculations are presented in a table given in the appendix for a range of Hi from 0.30 to 0.50 with ANH performed to minimum hematocrits from 0.30 to 0.15. Given a Hi of 0.40, if the Hm is assumed to be 0.25.then from the equation above the RCM count is still high and ANH is not necessary, if BLs does not exceed 2303 ml, since the hemotocrit will not fall below Hm, although five units of blood must be removed during hemodilution. Under these conditions, to achieve the maximum benefit from the technique if ANH is used, no homologous blood will be required to maintain the Hm if blood loss does not exceed 2940 ml. In such a case ANH can save a maximum of 1.1 packed red blood cell unit equivalent, and homologous blood transfusion is necessary to maintain Hm, even if ANH is used. This model can be used to identify when ANH may be used for a given patient and the degree of ANH necessary to maximize that benefit. Basically, the model considered above is designed to predict the maximum RCM that can save ANH. In summary, the efficacy of ANH has been described mathematically by means of measurements of surgical blood loss and blood volume flow measurement. This form of analysis permits accurate estimation of the potential efficiency of the techniques and shows the application of measurement in the medical field. The heart is the driver of the circulatory system, pumping blood through rhythmic contraction and relaxation. The rate of blood flow out of the heart (often expressed in L/min) is known as the cardiac output (CO). Blood being pumped out of the heart first enters the aorta, the largest artery of the body. It then proceeds to divide into smaller and smaller arteries, then into arterioles, and eventually capillaries, where oxygen transfer occurs. The capillaries connect to venules, and the blood then travels back through the network of veins to the right heart. The micro-circulation — the arterioles, capillaries, and venules —constitutes most of the area of the vascular system and is the site of the transfer of O2, glucose, and enzyme substrates into the cells. The venous system returns the de-oxygenated blood to the right heart where it is pumped into the lungs to become oxygenated and CO2 and other gaseous wastes exchanged and expelled during breathing. Blood then returns to the left side of the heart where it begins the process again. Blood flow is also affected by the smoothness of the vessels, resulting in either turbulent (chaotic) or laminar (smooth) flow. Smoothness is reduced by the buildup of fatty deposits on the arterial walls. The Reynold’s number (denoted NR or Re) is a relationship that helps determine the behavior of a fluid in a tube, in this case blood in the vessel. The Reynold’s number is directly proportional to the velocity and diameter of the tube. Note that NR is directly proportional to the mean velocity as well as the diameter. A Reynold’s number of less than 2300 is laminar fluid flow, which is characterized by constant flow motion, whereas a value of over 4000, is represented as turbulent flow. Due to its smaller radius and lowest velocity compared to other vessels, the Reynold’s number at the capillaries is very low, resulting in laminar instead of turbulent flow. Often expressed in cm/s. This value is inversely related to the total cross-sectional area of the blood vessel and also differs per cross-section, because in normal condition the blood flow has laminar characteristics. For this reason, the blood flow velocity is the fastest in the middle of the vessel and slowest at the vessel wall. In most cases, the mean velocity is used. There are many ways to measure blood flow velocity, like videocapillary microscoping with frame-to-frame analysis, or laser Doppler anemometry. Blood velocities in arteries are higher during systole than during diastole. One parameter to quantify this difference is the pulsatility index (PI), which is equal to the difference between the peak systolic velocity and the minimum diastolic velocity divided by the mean velocity during the cardiac cycle. This value decreases with distance from the heart. Resistance is also related to vessel radius, vessel length, and blood viscosity. l: length of tube. In the case of vessels with infinitely long lengths, l is replaced with diameter of the vessel. In a second approach, more realistic of the vascular resistance and coming from experimental observations on blood flows, according to Thurston, there is a plasma release-cell layering at the walls surrounding a plugged flow. It is a fluid layer in which at a distance δ, viscosity η is a function of δ written as η(δ), and these surrounding layers do not meet at the vessel centre in real blood flow. Instead, there is the plugged flow which is hyperviscous because holding high concentration of RBCs. Thurston assembled this layer to the flow resistance to describe blood flow by means of a viscosity η(δ) and thickness δ from the wall layer. The larger arteries, including all large enough to see without magnification, are conduits with low vascular resistance (assuming no advanced atherosclerotic changes) with high flow rates that generate only small drops in pressure. The smaller arteries and arterioles have higher resistance, and confer the main blood pressure drop across major arteries to capillaries in the circulatory system. Illustration demonstrating how vessel narrowing, or vasoconstriction, increases blood pressure. In the arterioles blood pressure is lower than in the major arteries. This is due to bifurcations, which cause a drop in pressure. The more bifurcations, the higher the total cross-sectional area, therefore the pressure across the surface drops. This is why the arterioles have the highest pressure-drop. The pressure drop of the arterioles is the product of flow rate and resistance: ∆P=Q xresistance. The high resistance observed in the arterioles, which factor largely in the ∆P is a result of a smaller radius of about 30 µm. The smaller the radius of a tube, the larger the resistance to fluid flow. Immediately following the arterioles are the capillaries. Following the logic observed in the arterioles, we expect the blood pressure to be lower in the capillaries compared to the arterioles. Since pressure is a function of force per unit area, (P = F/A), the larger the surface area, the lesser the pressure when an external force acts on it. Though the radii of the capillaries are very small, the network of capillaries have the largest surface area in the vascular network. They are known to have the largest surface area (485 mm^2) in the human vascular network. The larger the total cross-sectional area, the lower the mean velocity as well as the pressure. Substances called vasoconstrictors can reduce the size of blood vessels, thereby increasing blood pressure. Vasodilators (such as nitroglycerin) increase the size of blood vessels, thereby decreasing arterial pressure. If the blood viscosity increases (gets thicker), the result is an increase in arterial pressure. Certain medical conditions can change the viscosity of the blood. For instance, anemia (low red blood cell concentration), reduces viscosity, whereas increased red blood cell concentration increases viscosity. It had been thought that aspirin and related "blood thinner" drugs decreased the viscosity of blood, but instead studies found that they act by reducing the tendency of the blood to clot. r is the inside radius of the cylinder. is the cylinder stress or "hoop stress". For the thin-walled assumption to be valid the vessel must have a wall thickness of no more than about one-tenth (often cited as one twentieth) of its radius. When force is applied to a material it starts to deform or move. As the force needed to deform a material (e.g. to make a fluid flow) increases with the size of the surface of the material A., the magnitude of this force F is proportional to the area A of the portion of the surface. Therefore, the quantity (F/A) that is the force per unit area is called the stress. The shear stress at the wall that is associated with blood flow through an artery depends on the artery size and geometry and can range between 0.5 and 4 Pa. Under normal conditions, to avoid atherogenesis, thrombosis, smooth muscle proliferation and endothelial apoptosis, shear stress maintains its magnitude and direction within an acceptable range. In some cases occurring due to blood hammer, shear stress reaches larger values. While the direction of the stress may also change by the reverse flow, depending on the hemodynamic conditions. Therefore, this situation can lead to atherosclerosis disease.
. Friction between the fluid and the moving boundaries causes the fluid to shear (flow). The force required for this action per unit area is the stress. The relation between the stress (force) and the shear rate (flow velocity) determines the viscosity. Veins are described as the "capacitance vessels" of the body because over 70% of the blood volume resides in the venous system. Veins are more compliant than arteries and expand to accommodate changing volume. Differences in mean blood pressure are responsible for blood flow from one location to another in the circulation. The rate of mean blood flow depends on both blood pressure and the resistance to flow presented by the blood vessels. Mean blood pressure decreases as the circulating blood moves away from the heart through arteries and capillaries due to viscous losses of energy. Mean blood pressure drops over the whole circulation, although most of the fall occurs along the small arteries and arterioles. Gravity affects blood pressure via hydrostatic forces (e.g., during standing), and valves in veins, breathing, and pumping from contraction of skeletal muscles also influence blood pressure in veins. The ideal blood pressure in the brachial artery, where standard blood pressure cuffs measure pressure, is <120/80 mmHg. Other major arteries have similar levels of blood pressure recordings indicating very low disparities among major arteries. In the innominate artery, the average reading is 110/70 mmHg, the right subclavian artery averages 120/80 and the abdominal aorta is 110/70 mmHg. The relatively uniform pressure in the arteries indicate that these blood vessels act as a pressure reservoir for fluids that are transported within them. Pressure drops gradually as blood flows from the major arteries, through the arterioles, the capillaries until blood is pushed up back into the heart via the venules, the veins through the vena cava with the help of the muscles. At any given pressure drop, the flow rate is determined by the resistance to the blood flow. In the arteries, with the absence of diseases, there is very little or no resistance to blood. The vessel diameter is the most principal determinant to control resistance. Compared to other smaller vessels in the body, the artery has a much bigger diameter (4 mm), therefore the resistance is low. The arm–leg (blood pressure) gradient is the difference between the blood pressure measured in the arms and that measured in the legs. It is normally less than 10 mm Hg, but may be increased in e.g. coarctation of the aorta. 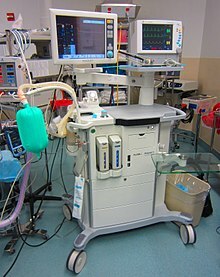 An anesthetic machine with integrated systems for monitoring of several hemodynamic parameters, including blood pressure and heart rate. Hemodynamic monitoring is the observation of hemodynamic parameters over time, such as blood pressure and heart rate. Blood pressure can be monitored either invasively through an inserted blood pressure transducer assembly (providing continuous monitoring), or noninvasively by repeatedly measuring the blood pressure with an inflatable blood pressure cuff. The word hemodynamics (/ˌhiːmədaɪˈnæmɪks, -moʊ-/) uses combining forms of hemo- and dynamics, thus "the dynamics of blood". The vowel of the hemo- syllable is variously written according to the ae/e variation. ^ a b Tortora, Gerard J.; Derrickson, Bryan (2012). "The Cardiovascular System: The Blood". Principles of Anatomy & Physiology (13th ed.). John Wiley & Sons. pp. 729–732. ISBN 978-0-470-56510-0. ^ Fieldman, Joel S.; Phong, Duong H.; Saint-Aubin, Yvan; Vinet, Luc (2007). "Rheology". Biology and Mechanics of Blood Flows, Part II: Mechanics and Medical Aspects. Springer. pp. 119–123. ISBN 978-0-387-74848-1. ^ Rand, Peter (31 May 1963). "Human blood under normothermic and hypothermic conditions" (PDF). Journal of Applied Physiology. Retrieved 16 September 2014. ^ a b c Caro, C.G. ; Pedley, T.J.; Schroter, R.C. ; Seed, W.A. (1978). The Mechanics of Circulation. Oxford University Press. pp. 3–60, 151–176. ISBN 978-0-19-263323-1. ^ "Efficacy of Acute Normovolemic hemodilution, Accessed as a Function of Blood lost". the journal of American society of anesthsiologist inc. Retrieved 5 April 2011. ^ a b Kaya, M.; Li, J.K.-J. (2001). "Hemodilution: Modeling and clinical aspects". Hemodilution:Modelling and clinincal Aspects. 1. IEEE. pp. 177–179. doi:10.1109/IEMBS.2001.1018881. ISBN 978-0-7803-7211-5. ^ Feldman, Jeffrey M.; Roth, Jonathan V.; Bjoraker, David G. (January 1995). "maximum blood savings by acute Normovolemic hemodilution". Anesthesia & Analgesia. 80 (1): 108. Retrieved 5 April 2011. ^ a b Costanzo, Linda S. (2003). Physiology. Board Review Series (3rd ed.). Philadelphia: Lippincott Williams and Wilkins. pp. 73–113. ISBN 978-0781739191. ^ a b c Munson BR, Young DF, Okiishi TH, Huebsch WW (2009). Fundamentals of Fluid Mechanics (Sixth ed.). New Jersey: John Wiley &Sons, Inc. p. 725. ISBN 978-0-470-26284-9. ^ Fung, Yuan-cheng; Zweifach, B.W. (1971). "Microcirculation: Mechanics of Blood Flow in Capillaries". Annual Review of Fluid Mechanics. 3: 189–210. Bibcode:1971AnRFM...3..189F. doi:10.1146/annurev.fl.03.010171.001201. ^ Tortora, Gerard J.; Derrickson, Bryan (2012). "The Cardiovascular System: Blood Vessels and Hemodynamics". Principles of Anatomy & Physiology (13th ed.). John Wiley & Sons. p. 816. ISBN 978-0470-56510-0. ^ Stücker, M.; Bailer, V.; Reuther, T.; Hoffman, K.; Kellam, K.; Altmeyer, P. (1996). "Capillary Blood Cell Velocity in Human Skin Capillaries Located Perpendicularly to the Skin Surface: Measured by a New Laser Doppler Anemometer". Microvasc Research. 52 (2): 188–192. doi:10.1006/mvre.1996.0054. PMID 8901447. ^ Tortora, Gerard J.; Derrickson, Bryan (2012). "The Cardiovascular System: Blood Vessels and Hemodynamics". Principles of Anatomy & Physiology (13th ed.). John Wiley & Sons. Laminar flow analysis. p. 817. ISBN 978-0470-56510-0. ^ Marieb, Elaine N.; Hoehn, Katja (2013). "The Cardiovascular System:Blood Vessels". Human anatomy & physiology (9th ed.). Pearson Education. p. 712. ISBN 978-0-321-74326-8. ^ Womersley JR (1955). "Method for the calculation of velocity, rate of flow and viscous drag in arteries when the pressure gradient is known". Journal of Physiology. 127 (3): 553–63. doi:10.1113/jphysiol.1955.sp005276. PMC 1365740. PMID 14368548. ^ Sircar, Sabyasach (2008). Principles of Medical Physiology. India: vistasta Publishing. ISBN 978-1-58890-572-7. ^ a b c Fung, Yuan-cheng (1997). Biomechanics:Circulation. New York: Springer. p. 571. ISBN 978-0-387-94384-8. ^ Rosenson RS, Wolff D, Green D, Boss AH, Kensey KR (February 2004). "Aspirin. Aspirin does not alter native blood viscosity". J. Thromb. Haemost. 2 (2): 340–1. doi:10.1111/j.1538-79333.2004.0615f.x. PMID 14996003. ^ Potters (13 February 2014). "Measuring Wall Shear Stress Using Velocity-Encoded MRI". Current Cardiovascular Imaging Reports. 7 (4). doi:10.1007/s12410-014-9257-1. ^ Tazraei, P.; Riasi, A.; Takabi, B. (2015). "The influence of the non-Newtonian properties of blood on blood-hammer through the posterior cerebral artery". Mathematical Biosciences. 264: 119–127. doi:10.1016/j.mbs.2015.03.013. PMID 25865933. ^ Lough, Mary (2015-04-15). Hemodynamic Monitoring: Evolving technologies and clinical practice (1 ed.). St. Louis, Missouri: Elsevier Mosby. p. 25. ISBN 978-0-323-08512-0. ^ a b Caro, Colin G. (1978). The Mechanics of The Circulation. Oxford [Oxfordshire]: Oxford University Press. ISBN 978-0-19-263323-1. ^ "Normal Blood Pressure Range Adults". Health and Life. 2010-06-07. Archived from the original on 2016-03-18. Retrieved 2016-02-06. ^ Klabunde, Richard (2005). Cardiovascular Physiology Concepts. Lippincott Williams & Wilkins. pp. 93–4. ISBN 978-0-7817-5030-1. ^ a b Markham LW, Knecht SK, Daniels SR, Mays WA, Khoury PR, Knilans TK (November 2004). "Development of exercise-induced arm-leg blood pressure gradient and abnormal arterial compliance in patients with repaired coarctation of the aorta". Am. J. Cardiol. 94 (9): 1200–2. doi:10.1016/j.amjcard.2004.07.097. PMID 15518624. ^ "haemodynamic". Oxford Dictionaries. Oxford University Press. Retrieved 2016-01-20.